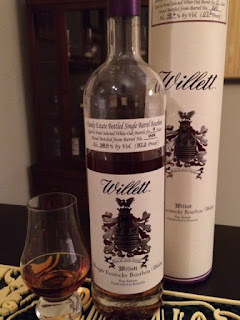 The Willett Distillery in Bardstown produces a variety of nice products. Their Willett Family Estate line is more or less a gift shop/Distillery only release of exclusively sourced whiskey. The downside of the WFE line is the price; you are you are paying for the limited release factor. That being said, these are very quality products and are usually worth seeking out. Nose: Sweet with initials whiffs of vanilla cream and fudge. Powdered sugar, toasted bread, and cinnamon spice balance a very bold yet elegant aroma. Taste: The flavors on the nose culminate into a french-toast style note on the palate. It's complex, with a strong herbal presence, baking spices, and vanilla flavored tobacco on the back end. Finish: Warming with hard-candied sweetness and spiced tobacco. A friendly heat lays in your chest for a long time. Conclusion: This is a smooth and complex bourbon. It balances most of the flavor spectrum; sweet, spicy, and herbal notes combine for an enjoyable drink. In addition to the juice, I must say I love the labeling/packaging. If you are on the bourbon trail, make sure to stick your head in the gift shop early in the morning and you may get lucky. Smooth Ambler Spirits Company is a craft distillery located in Maxwelton, West Virginia. While they distill a variety of spirits, they also source a significant amount of the whiskey they sell. They refer this sourcing as "scouting", thus all the whiskey they source is labeled under the sub-brand "Old Scout". 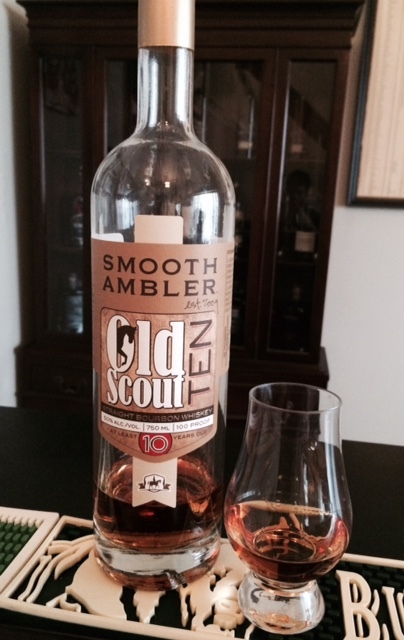 The label on Old Scout TEN states it is at least 10 years old, suggesting it is certainly some type of blend. Nose: Whip cream and salted caramel create the base of this bouquet. Peanuts, coffee bean, and leather also surface for a pleasant aroma. Taste: Sweet corn unfolds into a heavy nutty-vanilla note on the palate. Toasted oak combines with a significant earthy tone and a unique clay note. Finish: Medium in length with a sweet barrel char finish. Conclusion: This is a difficult bottle to find in my area so when I saw it at MSRP I picked it up immediately. Unfortunately, Old Scout TEN fell short of my expectations. It's smooth and the flavors are bold, however the overall taste doesn't do it for me. It's not bad by any stretch, but at $50 a bottle, there are many other bourbons I would recommend.